Panic has spread through the Ogudu Ojota area of Lagos State after some hoodlums, suspected to be working for a political party, went on the rampage. Three people have now been reported dead in the mayhem which started on Sunday evening. Shops and stalls were under lock and key on Monday as residents feared the possibility of a reprisal. Arguments and discussions relating to the elections were discouraged at newsstands in Ojota due to the volatility of the area. PUNCH Metro had reported that one person was confirmed dead after chaos broke out in the community. Property was destroyed by the hoodlums who trooped out as soon as the Independent National Electoral Commission announced the results of the elections in the state. Investigations by our correspondent on Monday showed that the death toll had increased to three. Among the dead was a tailor at the Ojota bus stop, identified simply as Femi, who was shot dead after he rushed out of a viewing centre where he was watching a football match. The identities of the two other persons, who lost their lives, had not been ascertained as of press time. Many residents were attacked with machetes by the hoodlums, who also entered into houses, searching for targets. 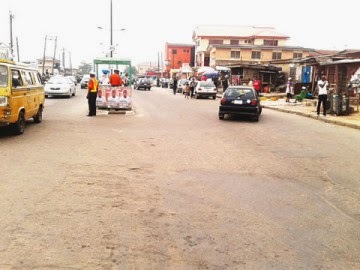 A resident, Jimoh Isaiah, said some of the hoodlums used sophisticated weapons. He said, “The guns were sophisticated. Femi was killed beside my house. He was watching a football match when he received a call that there was a fight. Isaiah also told our correspondent that he sustained injuries while running from danger.